Loved Living Heresubmitted by Sarah M. - Apr 10, 2019 |Recommended: YesThe staff is super nice and every maintenance report was handled swiftly. I only once had a problem getting the internet contractors to come out and fix it and the manager and staff were very helpful through the process The apartment is very dog friendly with lots of other dog owners and a nice dog park. I really enjoyed this apartment and am only moving to be closer to University campus but still staying within TLC Properties. response from property - Apr 11, 2019 Thank you so much for taking the time to leave us a review! We are glad to hear that you have enjoyed your residence at Orchard Park. Its a nice place to livesubmitted by Denise M. - Apr 03, 2019 |Recommended: YesIts a quiet community for the most part. I feel like it being so pet friendly it should not have any carpet. I would live here again. Fancy Apartment Buildingsubmitted by Acacia H. - Mar 31, 2019 |Recommended: YesAll apartments have thin walls, you're living in a cube amongst many. Orchard Park is an elevated version of an apartment building. They are clean with basic beige interiors that cover the essentials. All of the fancy amenities come from the clubhouse, pool, dog park and running track on the property. The leasing office also occasionally holds open parties or brunches for the tennants, which if you're social, is a really nice way to meet some neighbors. response from property - Apr 04, 2019 Thank you for your review. We are glad to hear that you are satisfied with your residence at Orchard Park. Hope to see you at our next community event! response from property - Apr 04, 2019 Thank you for your review Leann! We are glad to hear that you are enjoying your residency at Orchard Park and you are willing to tell others about us. response from property - Apr 04, 2019 Thank you Daniel! response from property - Apr 04, 2019 Thank you Shundrick! Still too new here to make a solid review but so far so good.submitted by Robert G. - Feb 25, 2019 |Recommended: YesIt's mostly quiet and well kept. Parking is a hassle in the evenings but aside from that there are no real complaints at all. Electric costs are low. Never have an issue with maintenance. They are prompt. response from property - Apr 04, 2019 Thank you for taking time to leave us a great review Robert! An excellent location, price, and experience.submitted by Timothy S. - Feb 02, 2019 |Recommended: YesI would highly recommend Orchard Park Apartments to anyone looking to rent in Springfield. The experience could not have been more enjoyable and easy. Hands down one of the nicest rental companies I have ever rented from. response from property - Feb 05, 2019 Thank you so much for your kind words! I am glad to hear that you have enjoyed your experience! Great Placesubmitted by Madison P. - Jan 31, 2019 |Recommended: YesI would say that it is great place to temporary live. I probably would not renew my lease but that is just my personal feeling for the fact that I do not like the apartment life style I would much rather be in a house. But overall I would say this is a decent place to live. Orchard Park is everything I could have asked for.submitted by Brenna J. - Jan 22, 2019 |Recommended: YesFirst of all, it was EXTREMELY difficult to find a place where I could have 3 animals as most complexes stop you at 2, but I refused to get rid of any of my babies. I'm sure there are more, but I only found 2 places that looked worthwhile where I could bring all of my pets. The other property was closer to my work, but I would be paying roughly the same in rent for a studio as I am for a beautiful one-bedroom with a balcony and SO MANY MORE amenities. The dog park is great and there are plenty of different walking routes I can take my puppy on, so we rarely go the same twice in a row. The staff is amazingly friendly and helpful, and Blake is a very understanding property manager. This is the first apartment I've ever had and I'm so glad I ended up moving here. response from property - Jan 23, 2019 Thank you so much for your review! We are very glad to hear that you are so happy with your decision to live at Orchard Park. An amazing family communitysubmitted by Brandy S. - Dec 31, 2018 |Recommended: YesI can’t say enough good things about our experience here at Orchard Park. It has been too notch Our kids love the monthly events, the pool and playground The staff is amazing. We are blessed to call this home. response from property - Jan 23, 2019 Thank you so much for your kind review Brandy! We are glad to hear that you and your family are happy with your choice to live at Orchard Park. REALLY NICE OVERALL AND SO WELL PRICEDsubmitted by Sydney L. - Dec 04, 2018 |Recommended: YesThere are all kinds of people in the complex, and everybody mostly keeps to themselves. The apartments are well taken care of and I love the price of mine. response from property - Jan 23, 2019 Thank you for taking the time to leave us a review! I am glad to hear that you are hapy with your choice to reside at Orchard Park. Overall a good place to live.submitted by Susan E. - Dec 01, 2018 |Recommended: YesHave lived here for several years. The staff is very friendly and helpful. Maintenance requests are handled right away. Not looking to move anytime soon. response from property - Jan 23, 2019 Thank you for your kind words Susan. 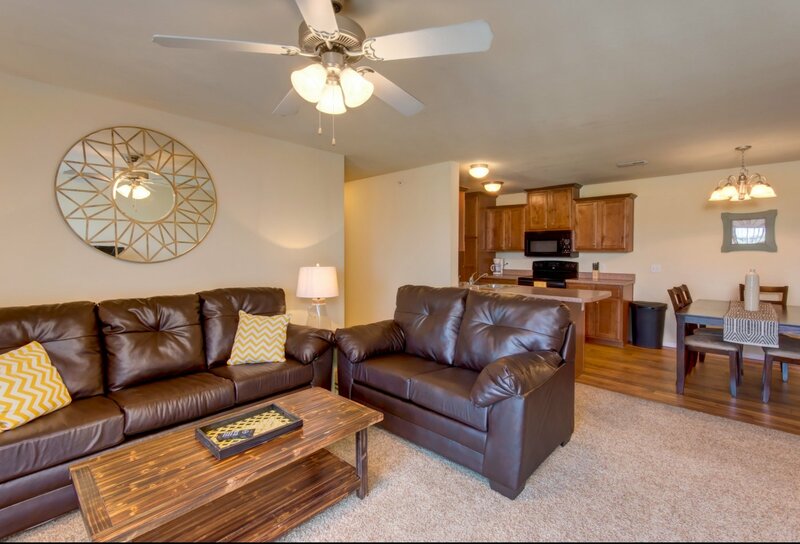 Love these Apartmentssubmitted by Kathrine M. - Nov 24, 2018 |Recommended: YesI love living here. The staff is so nice, and the aminities are out of this world. My teens and I have enjoyed having the Gym to work out in and when summer comes around we love to swim in the pool everyday. Can't go wrong with these people. Plus you are just 11 minutes away from a great school. Everything that any growing family would need.